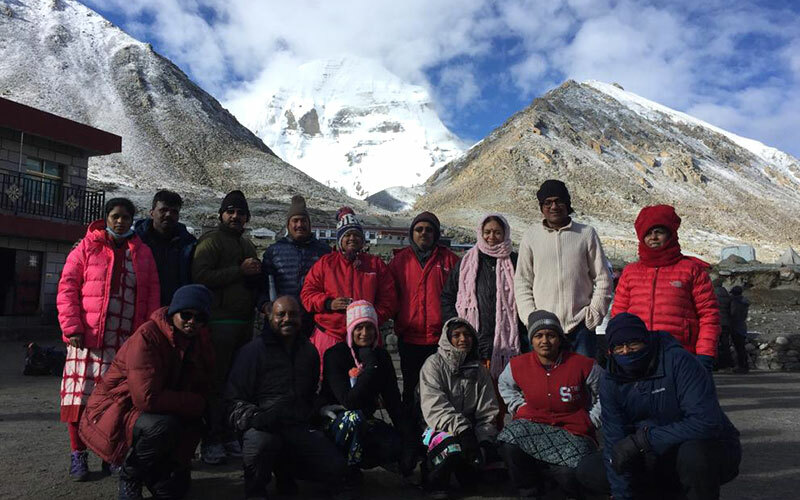 The majorly renowned trek to Mount Kailash is continually winning hearts of thousands of pilgrims all over the globe with its utmost spirituality. In order to accomplish a sense of divine satisfaction, devotees visit Mount Kailash via Lhasa while having some magnificent views from the mountains and other highly picturesque locations. Kailash Manasarovar Yatra via Lhasa is considered to be the most luxurious and an exclusive mean for completing the trail to Kailash Parvat. 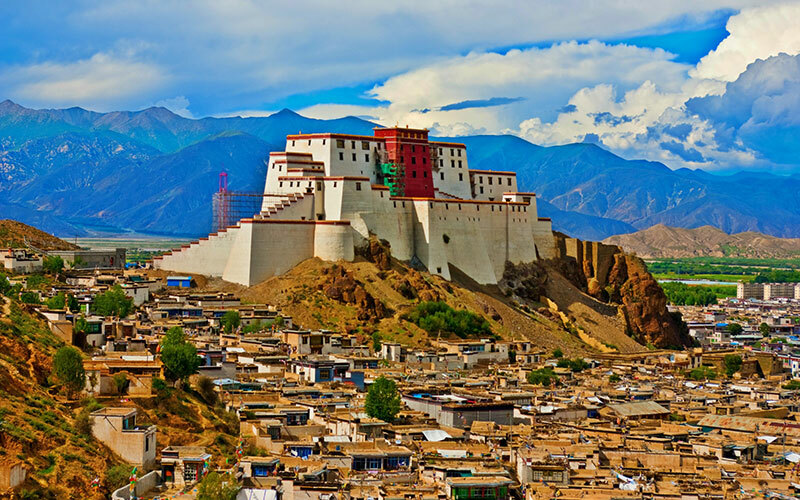 An experience for lifetime, the mesmerizing sites in Tibet while travelling amidst the beautiful Lhasa are literally a treat for the eyes of every pilgrim. Today have some delicious breakfast and then head towards the half day sightseeing in Kathmandu. 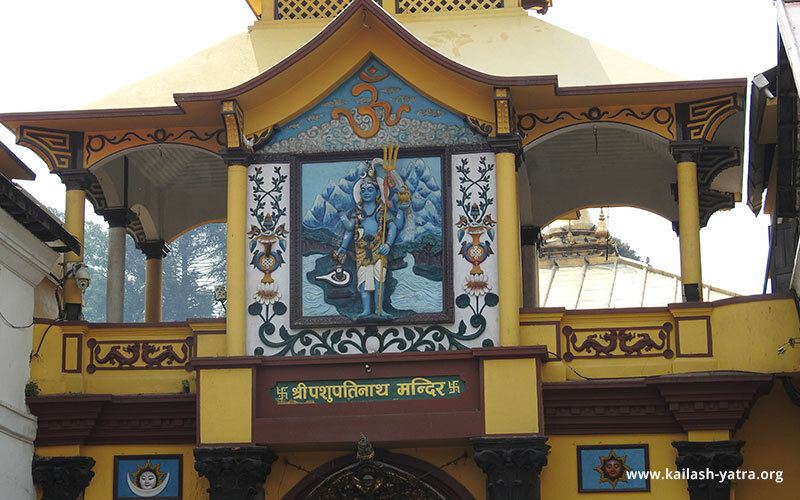 Explore the Pashupatinath Temple, Boudhnath Temple and also the Jal Narayan Temple (sleeping Vishnu). Once done with the exploration, attend a short briefing session organized by our tour guide and also get to know your other group mates. He/she will be explaining you the much needed information about the Kailash Manasarovar Yatra via Lhasa. Stay overnight at your hotel in Kathmandu. Eat your breakfast in the hotel and then you will be escorted to the Tribhuvan International Airport for boarding a flight to reach Lhasa. On reaching Lhasa’s Gonggar International Airport, our tour representative will be meeting you and from there he shall transfer you to your pre-booked hotel through a 2 hours’ drive. Spend this day while acclimatizing your body to the climatic conditions there since Lhasa and Kathmandu are located at a very high elevation. Spend the night at Hotel Brahmaputra or Four Points by Sheraton or similar in Lhasa. Have breakfast and then head towards the sightseeing of Lhasa. Today, you are going to explore the Jokhang Temple, Barkhor Street as well as the Potala Palace. Firstly, visit the Jokhang Temple that comprises of three floors accompanied with an open roof and some beautiful chambers as well as chapels. Once done, now is the time for you to indulge in the exploration of Lhasa’s oldest and highly traditional street i.e. the Barkhor Street. The street is considered to be an assembling hub of the Tibetan Norbulinka Palace culture and economy. 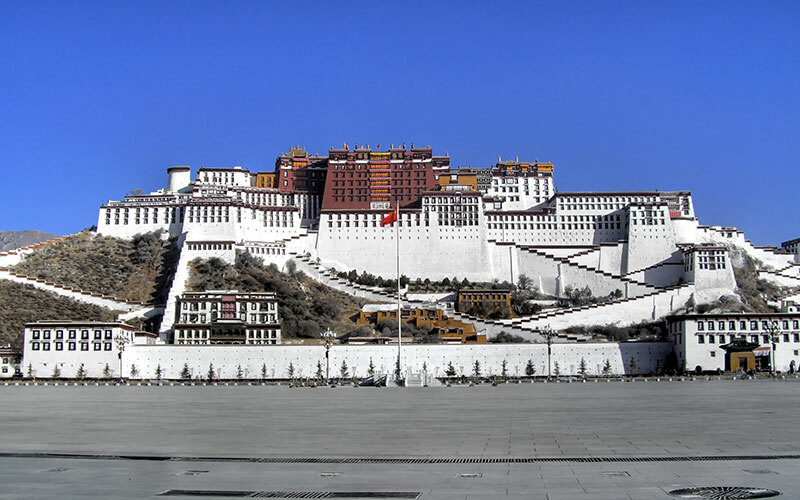 On its completion, the last sight is the Potala Palace that is witnessed as Dalai Lama’s Winter Palace that is 400 metres having some sloping stone walls. After this, your sightseeing of Lhasa comes to an end and then, return back to your accommodation and stay overnight there. Drive to Shigatse (3843 m) - 270 km/ 5-6 hrs. Once done with some breakfast at your hotel, it’s the time for you to visit the very beautiful Norbulinka Palace and after that drive towards Shigatse. On reaching there, explore the Tashilunpo Monastery built eminently by the first Dalai Lama in 1447. Stay overnight at Hotel Shigatse or Hotel Manasarovar or similar in Shigatse. Drive to Saga (4487 m). Wake up early today and then have some breakfast. After that indulge in a scenic drive to Saga and have some lunch that would be served by our representative in between the journey. Arrive at Saga and then stay overnight in Hotel Saga or equivalent. This day is going to be remembered for the whole life since you are going to have the first Darshan of Mount Kailash and Lake Manasarovar too. Have breakfast early morning and then start your drive towards Manasarovar Lake while passing amidst the Mayum - la pass (17000ft). Arrive at Manasarovar and from there you will have to change your transport and use the facility of the Chinese buses. After that, you will be doing the approx. 90 kms Manasarovar Parikrama by bus and then stay overnight at your dormitory styled guesthouse in Manasarovar. After some decent breakfast, drive towards Darchen that would be of approx. 2 hours. Reach Darchen and then stay overnight in your Darchen’s hotel. Optional Trip: You can also experience the Ashtapad excursion trip on special request and just in case there is no permission from the Chinese authorities for the transport services then you might have to trek from Darchen – Ashtapad – Darchen. It requires an additional night stay at Darchen. Head towards Tarboche from Darchen today and then pass through Yam Dwar in order to begin your Parikrama/ circumambulation of Mount Kailash. Commence your trek from Kailash’s South Face and end it at the Southern Face of Mount Kailash. 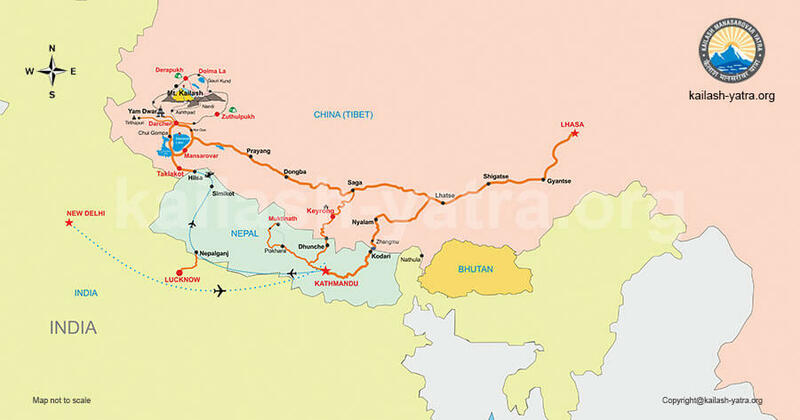 This 6-7 hours’ trek would let you reach Dirapuk where you will be staying for overnight. 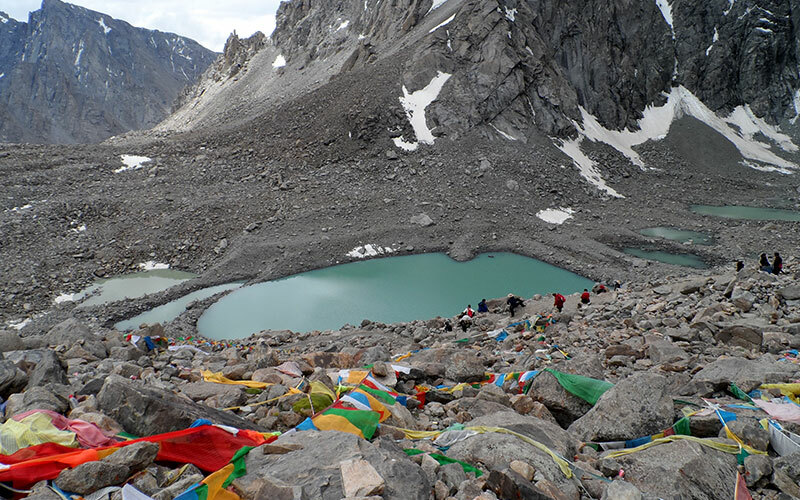 Those people who are not going to participate in this trek can wait at Darchen after visiting the Yam Dwar. Today, wake up early in order to see the Golden Kailash. This moment is considered to be the most beautiful one as this peak changes its colour when the sun rises and truly this view is worthy of being captured. After that, start your trek towards Zuthulphuk. Here you have to first climb up the steep surface up to the highest Dolma La Pass and then descend towards Gauri Kund and lastly walking on a flat base till Zuthulphuk. On reaching there, stay overnight at your accommodation in Zuthulphuk. 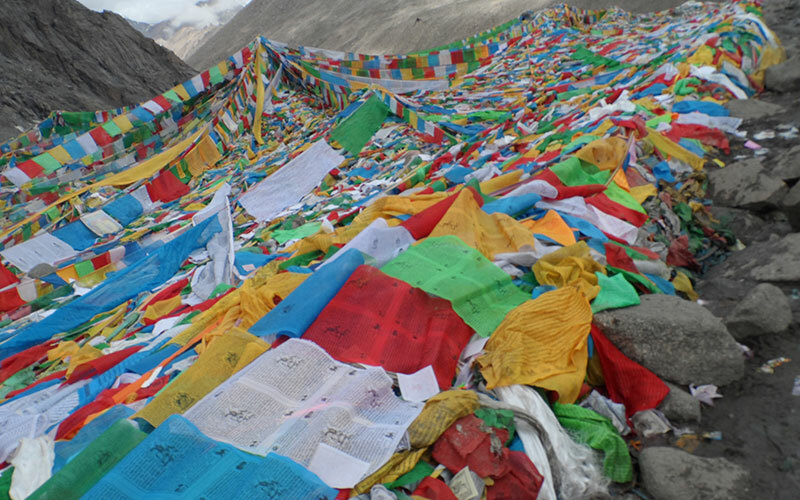 Start your last day of the trek today by indulging in the 2-3 hours of trekking for reaching the Darchen town. Wake up in the normal time and then begin your trail. In the midway, you will be picked up by a bus and it will drop you in or nearby your guesthouse in Darchen where the non-participants of the trek shall be waiting. From there, you will be indulging in the remaining 30% of the Parikrama/Circumambulation of Lake Manasarovar by continuing a scenic drive towards Prayang. Reach there and then relax at your guesthouse/lodge/hotel in Prayang or Dongba. After some tasty breakfast at your accommodation in Prayang, head towards Saga through a scenic drive. You will be reaching there in afternoon, take some rest or you can also explore the local markets in and around Saga. Overnight stay at your guesthouse/hotel/lodge. Have some breakfast and then it’s the time for you to say goodbye to Saga. Drive towards Shigatse and on arriving there, stay overnight in the pre-booked hotel at Shigatse. Today morning, once done with the luxurious breakfast take a scenic drive towards Lhasa and then overnight stay in your pre-booked accommodation there. The Kailash Manasarovar Yatra via Lhasa having a tenure of 16 days is one of the most favoured tour packages for reaching the hub of utmost spirituality Mount Kailash. Not only Kathmandu will be explored but also Lhasa is going to steal your heart with its pious sights filling up your days with abundant memories. Group joining trip with fixed departure dates. Minimum group strength 17 person. Extra expenses in the cases of any climatic conditions, natural disaster, technical failures, flight delay or cancelations, strikes, riots, political closures and/or any other situation/s beyond our control.